streams, oceans, children’s playgrounds, cattle ranches, birds and so on. Some pilots seem inclined to dismiss this problem entirely! but many small aircraft continue to run on it! (NaturalNews) America is being doused every minute of every day with the toxic heavy metal lead as it is burned in “avgas” — aviation gas, the fuel that powers most piston-driven aircraft (i.e. anything with a propeller). A grand total of 571 tons of lead are dumped each year into the air over our heads from aircraft alone, according to the U.S. Environmental Protection Agency. (3) about 681,000 gallons of avgas were burned each day in 2013. The National Emissions Inventory says that lead emissions are even higher than what I’ve calculated here. “Piston-engine aircraft are the chief source of lead emissions in the United States, emitting 57% of the 964 tons of lead put into the air in 2008, according to the most recent figures from the National Emissions Inventory,” reports the NIH. Some pilots seem inclined to dismiss this problem entirely. “I’m hooked on lead. Maybe not in the way a junkie is addicted to drugs, but hooked nonetheless,” writes Air & Space Magazine columnist David Freed, a Pulitzer Prize-winning investigative journalist. “But is the exhaust from my airplane’s 180-horsepower engine really that significant a national health threat…?” he asks. He’s right that his one airplane isn’t much of a factor in all this, but in a collective sense, if you combine all the piston-driven aircraft flown by pilots like Freed, it becomes a huge issue nationwide. 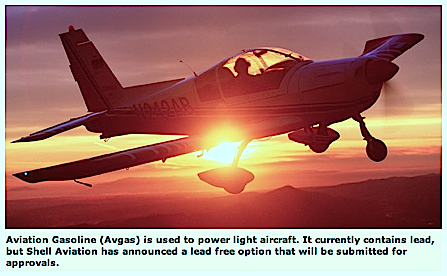 Avgas emissions are the number one source of lead emissions into the skies of America. THIS IS BEYOND THE INTENTION OF THIS SITE – THANK YOU !